Longtime fans of French niche line Parfums de Nicolaï know she generally does a new Eau Fraîche most summers, and some of you may remember her two mango entries: Eau Exotique (2005) and Eau Turquoise (2008). I think most people preferred Turquoise, but I preferred Exotique, and that is the one I own. In a reversal of the usual trajectory with older perfumes, the top notes have improved with age but the base has gone a bit off. If it was still for sale, I'd replace it in a heartbeat — it had all the sparkle that's missing from most modern summer limited editions, which tend to smell fresh but flat. L’Eau Corail, the latest in the series, returns to the subject of mango.1 Just as I'd hoped, the opening is beautifully sparkling, with mango, blackcurrant, plenty of citrus, and a quick flash of what smells like peach or apricot although neither are listed in the notes (other notes: petitgrain, orange, peppermint, jasmine, rose, osmanthus, cardamom, mate, sandalwood, cedar, musk and amber). I noticed the peppermint more on some wearings than others, but regardless, it provides a 'cooling' herbal bite in the early stages. After about 20 minutes or so, L'Eau Corail reminds me of Turquoise more than Exotique: it's soft, mildly fruity (now definitely apricot-ish) and mildy spicy, but without the huge juicy mango that dominated Exotique through most of its skin-life. There are sheer florals and a pale woody base. It isn't as overtly musky as Exotique (or the brand's Eau d'Été2), but it's musky, and something about the later dry down strikes me as just ever-so-slightly more masculine than some of the other unisex outings from Parfums de Nicolaï. Verdict: Corail is a sophisticated, nicely-done fruity scent for summer, if you need one. I personally don't love it as much as I'd hoped, and now I'm both missing Exotique and wishing I'd bought a bottle of L’Eau à la Folie (peach!) before that one disappeared. All the same, Corail is probably a must-try for any fans of Eau Turquoise who have already drained their bottles, and it's worth a shot for anyone who appreciates the brand. Have a favorite summer scent from Parfums de Nicolaï, or a favorite mango perfume? Do tell! 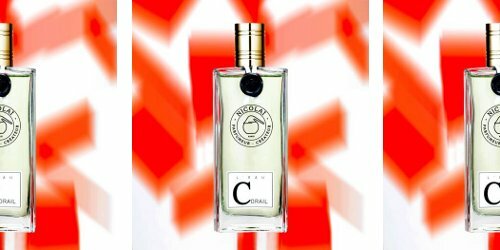 Parfums de Nicolaï L’Eau Corail is exclusive to the brand's website and Paris boutique. It is sold in 30 (€36) and 100 (€108) ml. 1. I should note that mango is not even mentioned in the brand description, so I am not meaning to imply that Corail is intended as a "mango fragrance"; you can see the brand description here. 2. Apropos of nothing, my bottle of Eau d'Été has aged far better than my bottle of Eau Exotique. The cinnamon has deepened dramatically — it now smells sort of like a summery cinnamon musk. I am moving it towards the front of the cabinet. Eau d’Eté is my firm favourite. Like both Turquoise and Exotique as well. And all her other eaux so far. Mixte is another great one, and Chic is quirky and bracing. I am so thrilled with how great my Eau d’Ete smells after 10 years! I bet you are, mine is in great shape as well. No idea when I bought it. Some 6 years ago I guess. One of my most worn summer fragrances, it just never gets boring. I can’t remember if I got mine in 2004 or 2005, but it’s darned old, and I’ve lost plenty of bottles to spoilage in the meantime. My equally old Balle de Match smells great too. I really like Chic, quirky is a perfect descriptor. Yep, you know how I feel about PdN and also I’ve been working like mad list week so I feel entitled to a little time of perfume chat! I mean last week. Paying extravagant attention to my spelling for a whole week seems to have had not effect whatsoever. I don’t think I have a firm favourite of the Eaux, although d’Ete would probably sneak through by a nose. (Should go try my aged bottle, which I’ve had for about 5 or 6 years – could stand more cinnamon.) I really liked Mixte when it launched, so thought that would be my other major staple, but I surprised myself by eventually falling in love with the peach in Folie. And then Chic is so different, it fills a niche that the other three citrus-based ones don’t. So I probably use Mixte the least of the four I own and Folie and d’Ete are nose-and-nose. I thought I liked Exotique and Turquoise, too, but ran across cheap bottles of both at one time or another and never pulled the trigger. Should’ve bought Folie, I knew it. It’s on my buy list! I like Vie de Chateau Intense. In fact, reading this post made me realize that it’s time to get it out and start wearing it! Vie de Chateau is such a great scent. I still have not tried the Intense version. Eau de Corail doesn’t catch my attention however ‘summery cinnamon musk’ most definitely does! Off to investigate Eau d’Ete… thanks! Will also say that I have not smelled a new bottle in 10 years! No idea if it’s the same. L`Eau à la Folie and Juste un rêve are my two favorite summer scents from this line but definitely interested in trying this new one too. LOL — hey, thanks, or not! If they do a code today I’ll have to buy it. Parfum1 still has both 1 oz. and 3.3 oz. (discounted) as well. No affiliation, just FYI. I love a la Folie. I really want to try this, first because for some reason, I don’t own any of PdN eaus – Weekend is the closest I come. And second, I feel like fruits are making a come-back. There was a period where people were so tired of fruity florals and such that nobody wanted to know anything about any fruit. That seems to be over – people are enjoying fruity notes again. Maybe it’s because we now have oud as the note non grata, or maybe I’m simply reading too much into my own cravings. Anyway, favourite mango: Bombay Bling. Agree it is much easier to enjoy a fruity floral now, whereas no interest whatsoever in even the most fantastic oud. I think I’ve only tried three of the line but L’Eau Chic is far and away my favorite. I bought my boyfriend two bottles over the years and this year might get myself one. On some days I prefer it to Eau Sauvage. It feels effortless (and, I guess, chic). Wish there was a nearby store that carried even some of the line. I totally agree with Mr. Turin’s opinion that Nicolai should work for Guerlain. Imagine the l’eau in AA bottles! It’s both minty and bitter-soapy. No surprise since she was inspired by soaps, according to Grain de Musc! It’s obvious comparison is Geranium pour Monsieur, but l’Eau Chic is maybe a bit more traditional. It actually reminds me of Gentian Blanc though perhaps a bit more retro and not as powdery. I love it, and it lasts a surprising amount for a cologne. When I get my bottle I can send you some. Though I have no immediate plans to get any., just before summer is over. Ah, that helps — I did not love GpM at all, nor did I love GB. So huge thanks for the offer (and the explanation) but don’t waste any on me! L`Eau à la Folie is gone? So glad I bought that bottle, then — feeling good about that. I don’t buy much these days. It is gone from her website at the moment, but no idea if she still makes it, and as posted above Beautyhabit still has it! I own Chic, Ete, and Folie and love them all. I bought a large backup of Folie when I heard it was being discontinued, as I can’t bear the thought of ever being without it. Perhaps time to pop in to the London PdN location during my annual Dec trip – especially now that it seems the AG boutique in Motcomb Street has closed.